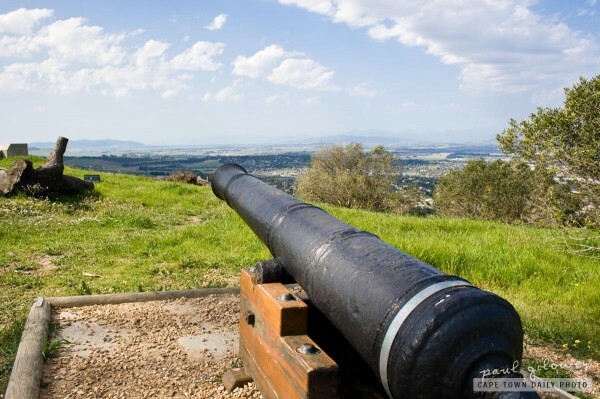 Don't be fooled - this isn't Cape Town's Noon Day Gun. (You know, the cannon on Signal Hill that's gone kaboom at noon almost every day since it's placement in 1902). To be honest - I last visited the Noon Day Gun when I was a young kid. In fact, I can actually hardly remember the visit! Since then Kerry-Anne and I have made two attempts to see the cannon fire - the first was on a Sunday, and the second on a public holiday... the two days on which the Noon Day Gun takes a break! This particular cannon is found on Tygerberg Hill and was presumably used as a signaling cannon to alert farmers as to the presence of new ships in the harbour. Posted in General and tagged cannon, hill on Monday, 18 October, 2010 by Paul. I was up there once to see it fire. Very impressive, but its so quick. Plume of smoke and a bang and then its all over. I love the Noon Day Gun. It’s been firing for over 200 years, though, not since 1902. This just makes me long for summer to kick in full blast! mjw, your’re correct that the gun has been signalling time since 1806; but not from it’s current location. It was moved to Signal Hill in 1902 and fired the first shot from that location on 4 August. I fall straight into the canon/cannon trap – and alwyas have to go back and double check! I have been trying to get out to Tygerberg hill to see the flowers but spring has just gone by as fast as the cannon smoke.